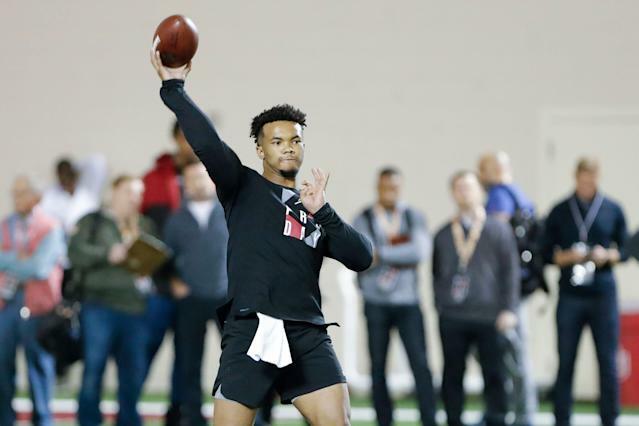 Forget for a moment that we just placed Oklahoma QB Kyler Murray to the Arizona Cardinals in our most recent mock draft. Look past the fact that we’ve done that in each of our previous two mock drafts. Ignore the overwhelming evidence that Murray looks like the guy at one. We’re just going to play fun hypothetical for a minute: What happens if the Cardinals decide they don’t want to take Murray first overall? It’s a fascinating scenario to unravel, and really, it’s not unprecedented. Rewind to the 2006 NFL draft when it was roundly assumed until about 48 hours before the first pick that the Houston Texans were going Reggie Bush at No. 1. I mean, why wouldn’t they? But then in the final hours the news leaked out: Mario Williams would be the guy. And I think they took the better NFL player. Heck, even last year Baker Mayfield wasn’t a sure thing until the very late stages. So you can’t rule out the Cardinals passing on Murray. Our own Charles Robinson wrote a great piece Thursday night on the five most-lied about 2019 NFL draft prospects that should serve as a great backdrop for this story. And yep, Murray was first on Robinson’s list. The question then becomes: Where does he end up? It’s less about how far he might fall because I suspect he wouldn’t even get past the fourth pick. We should be asking which team might be getting him. You’d have to think their ears would immediately perk up if news got out that Arizona was passing. The most likely scenario would be the Cardinals (or San Francisco 49ers, if Arizona took Nick Bosa or whatever) asking for one of the Raiders’ two late first-rounders, Nos. 24 and 27 overall. Would the Raiders give one up to get Murray? It would be harder to justify doing that if you’re Oakland, knowing your chances of coming out looking good on the Khalil Mack and Amari Cooper deals is lower unless Murray becomes a top-10 QB. After all, that’s one fewer pick to hit on. Long shot? Yes. But keep Oakland in mind just in case. There’s at least a tangible connection here, with Murray visiting the Giants this week. This also would be a sign that maybe the Giants are not locked into a type of quarterback, or rather, an Eli Manning clone. Murray is about as much of a polar opposite, style-wise, to Manning as two quarterbacks can be. The idea of putting Murray and Saquon Barkley in the same backfield is incredibly enticing. Of course, the sad part is that Odell Beckham Jr. is no longer a part of this hypothetical situation. Still, the Giants likely wouldn’t have had enough ammo to get up to No. 1 (or thereabouts) to get in range to take Murray, although the 49ers – who coveted OBJ – might object here. The Giants own Nos. 6 and 17 in the first round, plus an early second-round pick. You figure it would take both firsts to get up to that first selection to get Murray. Would that be worth it? For Giants fans hearing rumors about Daniel Jones or Drew Lock, the answer might be a resounding yes. File this as yet another long shot but one we can’t completely close the door on. Andy Dalton most definitely is entering a flashpoint season. The team will not extend his contract, and it can get out from under his deal with shocking ease after the year. This might be the perfect chance to pounce on a QB, giving him a year to learn and be ready to take over full time in 2020. Perhaps they like one of the other QBs; the one most commonly linked to Cincinnati has been Ohio State’s Dwayne Haskins. It would not be stunning to see Haskins on the board when the Bengals pick in Round 1, at No. 11 overall. Of course, the leap from 11 to 1 is a relatively cavernous one. Might it also take A.J. Green in a contract season to make that deal happen? See, that’s the problem. If you draft Murray, it would make more sense to give him a veteran weapon such as Green to thrive, and signing him would be easier knowing that you’re building around Murray and moving on from Dalton’s contract. Ultimately, the cost might be too high. We don’t believe that Nos. 11 and 42 would be enough; the Bengals likely would have to throw in something else pretty darned sweet. That’s why this connection is a bit too tricky, even if there’s some sense involved. The Dolphins are most likely to have a very blue-collar approach to this draft as GM Chris Grier and head coach Brian Flores set sail on what could be a rocky 2019 season. It would appear all eyes are on the 2020 campaign. And that’s different from saying they’re tanking, which we don’t believe. But if the Dolphins don’t think they can find a star QB in this draft and are more interested in next year’s potential crop, then why shouldn’t they wait? If that’s indeed the plan, salute them for their patience. Too often, this has been a franchise that has felt the need to make big, flashy moves that lacked substance or vision. It has been a front office with a lot of strong voices in the past, perhaps too many shouting over each other, so a slimmed-down leadership corps might be exactly what’s needed here. But what really would be interesting is to see how the Dolphins felt about Murray, should he become available. Like the Bengals, the Dolphins lack the draft-pick firepower to vault up double-digit spots to No. 1 (or even 2 or 3) without giving up next year’s first-rounder. And if this is a rebuilding season, why would they give up a first-rounder the following year? There are too many dots to connect here, and frankly it feels a bit too fantastic to get on board. Maybe the Cardinals would insist on the Dolphins throwing in Minkah Fitzpatrick, and we don’t believe Miami would do that – even for a potential franchise QB. So while this is a possibility that can’t entirely be ruled out, it’s one we’re not placing any kind of significant wager on. OK, now this is fascinating. Reality check: What could the Redskins offer to get up that high? And wasn’t the Washington-Arizona swap supposed to involve Josh Rosen? The recent scuttlebutt is that the Redskins might not be as enamored with Rosen as some reports suggested they were a few weeks ago and that they are doing work more on this year’s college QBs. That could mean Haskins or Drew Lock, for all we know. Maybe it’s Will Grier, a quarterback we’ve been told not to overlook when trying to connect prospects to Washington. But it could mean Murray. And that feels more of a Redskinian move, doesn’t it? Much more so than sitting back and taking what comes to them, we’d argue. After all, it has been a minute since this franchise made noise in the offseason. 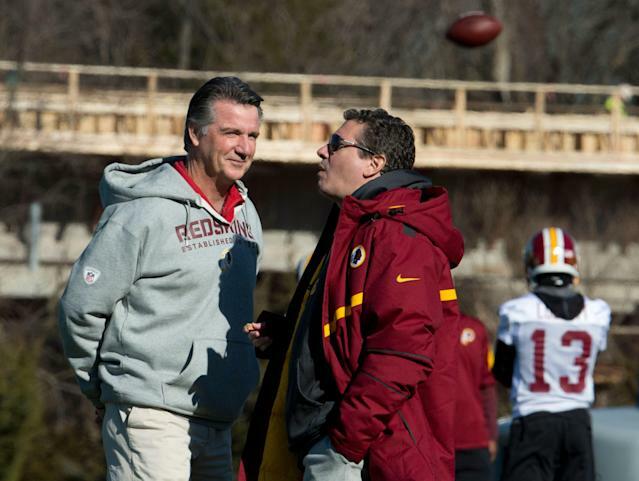 Fire Bruce Allen has become a hashtag this offseason. Jay Gruden, already the longest-tenured head coach under team owner Daniel Snyder, has to know he’s on borrowed time. And Snyder can’t love being an afterthought heading into the 2019 season. What the Redskins have is twofold: a need for some juice and a strong desire to be newsworthy. That’s been the case for most of Snyder’s tenure, and yet the need might be stronger now than it has been in a decade. Alex Smith’s contract has become a massive anchor. The trade for Case Keenum is little more than a short-term Band-Aid. And most of all, desperate teams tend to do desperate things. Could the Redskins push all the chips to the middle on a Murray trade? Picking 15th overall certainly hurts them, and their second-rounder (46) isn’t enough to get it done. But they also have two third-rounders and two fifth-rounders with which to play, and maybe they’re willing to dip into their 2020 draft till to get something done. They also have a few potential trade pieces they could consider – Keenum? Josh Doctson? Derrius Guice? Brandon Scherff? Doctson and Scherff are both 2020 free agents, and the team might not be willing to meet Scherff’s financial demands, so you never know. And don’t rule out the Keenum-Kliff Kingsbury connection; Kingsbury was his college position coach while running the “Air Raid” offense, and they share an agent. There might be enough here to make a deal worthwhile. Of all the teams on this list, the Redskins might have the farthest to travel in terms of draft capital, and the Cardinals might flat-out reject the idea of dropping 14 spots in Round 1. But you cannot rule out the sheer will of a Redskins team that hates the fact that its fans are starting to turn on the franchise out of malaise over the seemingly rudderless direction of the team. Would a Murray blockbuster change that? It might. The only question then would be whether the Redskins could meet a steep asking price for the top pick.